You'll definitely want to shell(ac) out for one of these. 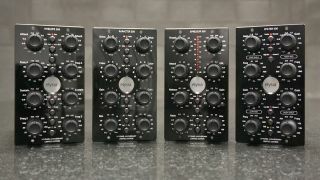 Elysia is marking its 10-year anniversary with a limited run of vinyl-fronted modules, but you'll need to be quick as there are only 50 units per module available worldwide. The brittle black stuff adorns the company's karacter, nvelope, xfilter, and xpressor 500 series modules. You won't need to worry about any scratches or warping to the record, though, as each vinyl front is mounted on a steel plate and powder-coated. And, of course, you won't want to use just any old bolts when fitting them into your studio, so each one is completed by a set of included lens head screws to match. What we're not entirely sure of is what exactly is cut into each record used for the job, but we can tell you that the modules are available for sale now for £591.60 each. Check out the Elysia website for a list of dealers.